This map shows the location of the north magnetic pole (white star) and the magnetic declination (contour interval 2 degrees) at the beginning of 2019. Credit: NOAA NCEI/CIRES. Earth’s northern magnetic pole isn’t fixed but, rather, is in a perpetual motion driven by the movement of the planet’s liquid outer core. 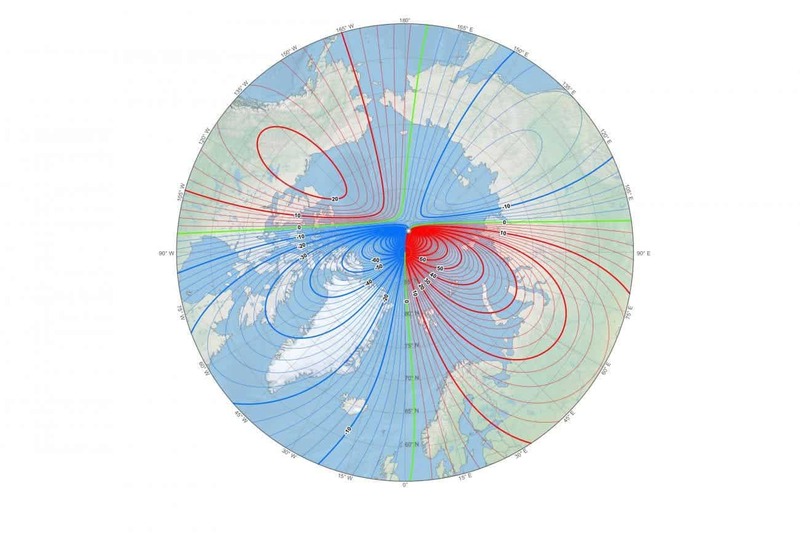 In the last couple of decades, scientists have noticed that the northern magnetic pole has been shifting away from the Canadian Arctic toward Siberia at an unprecedented rate. This anomalous variation has forced scientists at the National Centers for Environmental Information to publish their update to the World Magnetic Model (WMM) a year early in order to avoid significant inaccuracies in navigation and positioning. The WMM is used by everything from smartphones to the military. The planet’s outer core is formed of liquid iron which constantly moves as the planet’s interior gradually cools down. This motion creates electric currents as electrons move through the liquid and, in the process, the energy of the fluid is converted into a magnetic field. If we imagined that Earth’s magnetic field is similar to a bar magnet (or dipole), then we can locate a geomagnetic north and south pole. However, this is an oversimplification of the complexity and variation of Earth’s true magnetic field. Confusingly, scientists refer to the places where the planet’s magnetic field is vertical as the north and south magnetic poles. If you were standing over the north magnetic pole with a compass, the needle would dip and point towards the south pole, hence its other name: the magnetic dip pole. Over the south magnetic pole, the compass needle would try to point upward. The northern dipole is roughly off the northwest coast of Greenland and its position has changed very little over the last century. The same can’t be said about the northern dip pole (true magnetic north pole), which has marched north by hundreds of miles in the last couple of decades. Up until the 1950s, the north magnetic pole had been moving at a rate of about 11 km (7 miles) per year but since the 1990s, this rate has jumped to about 54 km (34 miles) per year. Strangely, the south magnetic pole has shifted very little during this time. Scientists aren’t sure what causes this anomaly but the leading theory is that surges and flows in the swirl of liquid iron in the core are creating a tug between two magnetic patches: one under northern Canada and one under Siberia. The latter patch seems like its exerting more influence, hence the rapid shift of the magnetic north towards it. Historically, the WMM has been updated every five years in order to keep up with these movements. The most recent update was scheduled for 2020 but researchers at the National Centers for Environmental Information — a collaboration between NOAA and the British Geological Survey — decided that it had to be released much sooner so as not to disrupt navigation, especially over the Arctic. The new model was pre-released online in October 2018 but its official release was delayed by a 35-day government shutdown. It’s only recently, after President Trump temporarily lifted the shutdown on January 25, that the WMM has finally been updated. The new model has the North Pole a good 25 miles away from the one previously predicted. This gross discrepancy means that updates in the future will have to be made much more often than before, preferably yearly. But while the WMM is also incorporated by things like Google Maps, regular folks shouldn’t worry too much since the north magnetic pole’s movements aren’t all that important for latitudes below 55 degrees.